Protesters rally in front of the military headquarters in the capital Khartoum, Sudan, Monday, April 8, 2019. Gunfire was heard outside the Sudanese military headquarters in the capital of Khartoum Tuesday as demonstrations seeking the ouster of President Omar al-Bashir continued for a third consecutive day. 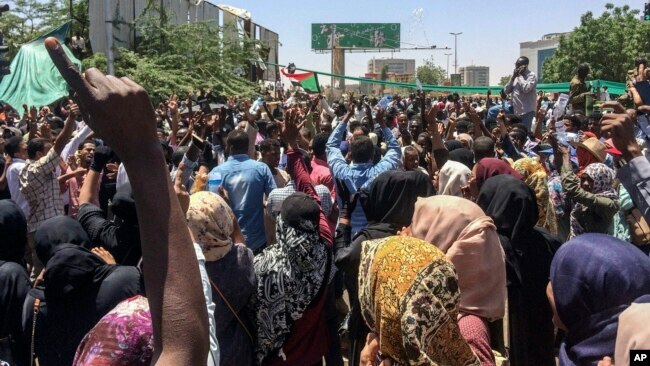 Large groups of protesters have been gathered outside the compound since Saturday calling for the end of al-Bashir’s 30-year autocratic rule. Interior minister Bushara Juma said Monday that roughly 10,000 protesters rallied outside the headquarters on Saturday, one of the largest crowds since protests broke out in more than three months ago. Six people were killed in the capital city of Khartoum when security forces dispersed the protesters. One other person died in a related protest in the state of Darfur, Juma said. The protests began on December 19, with demonstrators accusing Bashir's government of economic mismanagement that has sparked skyrocketing food prices, and fuel and foreign currency shortages. Bashir imposed a nationwide state of emergency on February 22 in an attempt to suppress the protests after an initial crackdown failed. The government said weeks ago that 31 people had been killed, but the group Physicians for Human Rights estimates the death toll is at least 60. The government continues to enforce tough measures that have resulted in the arrests of protesters, opposition leaders and journalists.